We proposed an initial version of this wall when we designed the Lagom House, but now we believe we've made significant improvements. Gone is the exterior foam insulation layer. Foam insulation is expensive, and it is difficult to place on the exterior without creating an unwanted vapor barrier. Instead we rely on lessons from the Swedish wall to replace the thermal break that foam offers. First we are starting this with a wall design for northern climates. Designs for southern climates are different, particularly in the vapor profile. So keep in mind this design is for a heating centric climate. We are planning this wall for 2x6 or 2x8 versions. The 2x8 versions offer a greater insulation level for those that desire it. Starting from the interior here are the layers of the wall system. • Interior finish is assumed to be gypsum wall panels, the commodity wall finish in the USA. • Next we have an electrical and plumbing furring space. This space is created with 2x2 furring members, and is insulated with fiber glass batts, 1.5" thick for an insulation value of R6-6.5 depending on the product chosen. This insulation is typically more rigid than batts and is sold as a fiberglass "board". This actually facilitates cutting openings for electrical boxes and other penetrations. The horizontal furring allows the insulation layer to break the thermal transfer of the main stud wall in the same way exterior foam insulation does, but it does so with out creating a problematic exterior vapor barrier, without expensive foam insulation, and with the added benefit of a dedicated wiring chase space that allows us to build a tighter primary wall. Thank you Sweden. • Next is a continuous vapor barrier - a plastic sheet that runs continuously from top plate to floor plate. Because all of our wiring is in the furring space there is no reason to penetrate this vapor barrier allowing for a very air tight wall to be created. • Next is our insulated stud space based on 2x8 or 2x6 studs, 24"oc will suffice for these strong studs. Un-faced batt insulation can be used since we have an independent vapor barrier layer. And since there is no wiring or other obstacles in the wall the batts can be installed neatly, and completely filling the voids. Batts have a bad reputation for sloppy insulation. One thing the Swedish walls show us is that its not the batts, but the obstacles that are the problem. These walls can be as tightly filled as any highly insulated wall without the wires and piping to struggle against. Now what insulation to use? The major insulation manufacturers in the US offer two densities. Always choose the higher density with the higher R value. For a 2x6 wall that will be R21 batts. For the 2x8 wall we have quandary - US manufacturers do not make batts for 2x8 walls. 2x6 walls, yes. 2x10 ceilings and floors, yes. 2x8s you are out of luck. Until they begin we have two options. We can use 8" R30 batts, and compress them 1" into the 7.25" space of a 2x8. This will diminish their R value somewhat - don't count on more than R28. Or you can do two layers: a 1.5" R6 + a 5.5" R21 for a total of R27. In the meantime, Owens Corning and Certainteed - WAKE UP! We need wall batts for 2x8 walls. • Last but not least is our sheathing and exterior wall system. This remains open ended. Commodity builders are going to want to use their composite Zip sheathing and cheap vinyl siding. Green builders will use a sophisticated rain screen cladding system. And everything in between. 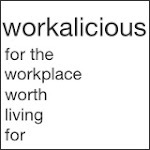 All will work here. Once accounting for total wall R values that take in studs and solid framed portions of the wall you can probably expect the 2x6 wall to come in R23-24, and the 2x8 wall R30-31. This is clearly enough to contribute to a Passive House, but even if you are not looking to build a certified house you have an easy to build high performance wall using commodity construction products. If we can get builders making houses with walls like these then soon we can forget about certifying standards and just build every house to a high level of performance. We can do this now. Its time to demand it. Not a bad looking wall. What detail would you propose at each deck to maintain the insulation and airtight layer? I'm still not quite convinced a double 2x4 is not less expensive and easier for the trades, but I like this. I'd also highly recommend Knauf EcoBatts for this application as they have recycled content and are much friendlier tonwork with. Cellulose batts would also be an option, but pricier and harder to source. Great info Chad - thanks. Perhaps a smaller, more "eco" oriented insulation maker would be willing to make batts for 2x8 walls. I'd love to see the rock wool they use in Sweden come here - higher r values per inch. I think (2)2x4 and 2x8+furring have to be very close in cost. But I'm guessing that one 2x8 wall is not much more labor than one 2x4 wall, and that the layer of furring is less labor than a second 2x4 wall. The issue is not in the framing - rather its that the insulation sub-contractor has to install twice. Once when the main stud space is closed up, and again after all the wiring is done and inspected. Doing this wall in panels in a shop makes so much more sense. As far as the vapor barrier and a second floor - I'm still studying this as many Swedish factories handle this detail slightly differently. But generally what is done is the vapor barrier runs continuously up the wall by-passing the floor deck. A ledger board is located within the 2x chase space fastened back into the wall studs, and so the bearing for the joists all happens within the vapor barrier, and joist ends never extend into the main insulation space. Very neat and tidy, but its not strictly platform framing - more similar to balloon framing, except there is a panel joint at the floor level. They also seem to insulate the perimeter of the floor system extending a couple of feet in from the exterior wall, even though the framing does not penetrate to the exterior sheathing. I think this is to off set the solid wood thermal bridge that results where top and bottom plates of the wall panels meet. Very thorough of them and typical. Aha - Knauf is not a small company. They are huge word wide manufacturer of insulation products, but only offering their recycled content fiberglass here. They have rock wool and mixed mineral & glass wool products in europe. We could use these here. Actually, studying their web site you can tell that the "Eco" insulation they are marketing here is the composite glass and mineral wool insulation they market elsewhere - mineral wool is the brown content in the batts. I'm sort of dumfounded that they need to build this whole "Eco" branding around what is no doubt a technically superior product. They should just call it what it is. I'm guessing they don't offer the mineral wool because focus groups said that it looked "dirty".. I love the idea of the 2x2 chase for wiring/plumbing thus maintaining the integrity of the 2x6/8 wall cavity but wouldn't a electrical box's depth intrude into this space? It leaves you with space for a 2" electrical box, which does not have a tremendous amount of room inside, and is not particularly common either. But it would be fine for power outlets and light switches, if not a junction box with a lot of connections inside. Keep in mind it would be very easy to use a 2x3 furred space on a specific wall if it was needed. This would net a 2.5" clear space and would fit a 3" box. Stephen - I reread my response and I did not want to leave it sounding like there was no way to wire in the 2x2 space. 4x4 boxes 1.5" deep are common, and you can mate these with single and double gang face extenders for mounting switches and outlets. These would be about 20cu in which is bigger than a typical single gang box 3" deep. Its different than working in a regular stud space, but everything you need is off the shelf. Keeping the wiring in the furred space is really an essential component of this wall idea - you basically should only poke though that plastic sheet for really really good reasons. The way we build this detail is completely additive. I think the cost would equate in price increase to the cost of labor to sheet rock a job. Frame, insulate, install plastic sheet, frame, rough in electric, insulate, install sheetrock. Since the production builder's whole process depends on a critical path system that keeps the parade of trades short, this wall is going to be much more expensive for anyone except the builder with a multi skilled crew who can take these tasks on with the same efficiency as the specialist contractors. So while this could be a "standard" type of wall - given our current trade practices, this is much more expensive wall to build. The Swedish wall has another layer, which might be useful to show, which is a layer of fiber glass "wind paper" which is like the stuff stapled underneath mattresses. That is trapped under ANOTHER row of battens, creating an air gap between the siding and the insulation. People in the USA take to calling this "rain screen". Even though there is added cost, I can't see why a an electric box maker like Carlon would not want to offer a line of boxes designed to wire in the depth of a 2x, and which was careful not to allow things to screw though the back of the box. Wiring in a furred space must be generally useful idea - it could even be used to retrofit old buildings, and so have wider application. Are there any electrical code issues which requires the wires be nail proof if so close to the face of the wall? That seems to be what metal conduit is for in the USA. Wiring in Europe is done with flexible tube conduit and by fishing individual conductors though the tubes. What we call NM is used mainly for exterior (wet) apps ... and even then they run it exposed. Are there some code issues here with shallow wire depth? I think you should brand this wall and take it to carlon and design the "LaVardera Box system" to go with it. I agree that a small builder with a multi skilled crew will be able to build this wall much more economically than a builder who subs everything out. The builder who is a "construction manager" needs two visits by subs as Scott outlined above, while the carpenter/builder who will insulate themselves can work through this without delay. Scott - I did not show any of the exterior finish systems. Yes, some will use the various plastic wind barriers here, some still use tar paper which may be more durable than the tyvek, but the latest fad is the green Zip wall which has an airbarrier painted on the sheathing panel and has its seams taped to make the air barrier. Any and all can work with this wall system. I prefer the beautiful exterior cladding done in Sweden, but if a high performance wall is going to get traction here it has to be open ended in terms of how builders will clad it. To play devil's advocate, I can see rushed, indifferent or poor drywall subs screwing board into insulation, screws through wire, furring strips misaligned, not to mention those inevitable change orders, "No, the sink was supposed to be over there!" Another thing that struck me during this whole series is the absolute beautiful raw materials the Swedes were using. Can the average building supply source straight and true 2x8's like the Swedes were usng? What about the furring strips too? I don't know whether this could be built as an onsite system. I certainly wish someone would try. I think the only time you have a hazard of a screw going into a wire is where a wire passes through a stud - because screws go into studs. Wires running in the chase space won't need to do this, and risers actually can pass between the furring and the vapor barrier. If drywall screws are the proper length they would never reach through the furring. The lumber in Sweden is clearly superior, which is depressing for us, but even more remarkable that they build houses for everyday folks of such exceptional quality. I think the bigger question you are asking is: Are we up to this? Do we have it within ourselves to rise to the occasion and tackle some reasonably small practical issues to build a better house. Or are we so habituated to what is expeditious and inexpensive that we'll be incapable of building a better house? This wall is a process solution to making a high performance wall. No new materials, but a bit harder to build. There are plenty of alternatives out there with new or unconventional materials, many have been on the market for a long time, and none have displaced the status quo. I think we need to evolve rather than revolutionize the way we build. We want to build a better wall, and better is always going to be more work. There is no short-cut to building more value into construction, no free lunch. BTW, in the Swedish system there's a particle board layer under the gypsum. Do you know why? What benefit would that give the wall? simpler solution is to use combination of 2" sprayed closed cell foam and bats in 2x6 wall for total r of 27. sprayed foam eliminates need for vapor barrier, laminates the the whole structure and creates air tight envelope. if our client wishes to go step further we go staggered 2x4 studs over 2x6 plate. very simple and quick system for builder too. my own home is staggered 2x6 and 2x4 studs over 2x8 plate for total r of 33. our bills for gas are 1/4 compared to similar home , conventionally built. Dimwit - the particle board, or t&g boards for some Swedish factories, is simply to enable you to hang shelves, or cabinets, or anything without having to find a stud. I know. This is so beyond the fathom of our sensibility here in the US. The material is cheap, its easy to add in the factory, it adds value and convenience. Brankulo - there are many ways to build a wall and that certainly sounds like a fine one. However I am not convinced that what you have outlined is simpler, nor am I sure the vapor barrier created by the spray foam is wise to place on the cold side of the wall. The dew point has to be looked at carefully, and you have to be resolved that an out of normal cold spell may move it into your interior moist air. What I aimed to propose is a generalized solution using commodity materials from the same sources as the status quo. If the industry was ready to adopt new process and materials I suppose it would have already happened. believe me it is way simpler. just go trough steps for each system, count them, price them in relation to the result you are getting. i would say most labor intensive process would be sealing all air leeks to achieve same air tight envelope as for what is granted with sprayed foams. also,given the foam is sprayed to the exterior portion of the wall doesnt necessary mean that vapor barrier is located on cold side of your assembly, as the mass of the foam itself creates the barrier, not just the plane where it meets sheathing. even two inches of foam give you r14 comparing to bats in 2x4 wall that is r13. so placing vapor barrier on warm side of 2x4 wall is pretty much same scenario as having 2"foam. also you can spray your whole cavity if you wish. brankulo, you've described two types of walls, one staggered studs and one not. I don't believe a staggered stud wall will ever be "simpler" or less labor simply because of additional cutting and fastening - you can't get away from the fact you are building two walls. I'm not saying that it is not a better wall, just something that the status quo will not find simpler. As far as the spray foam, again, I believe that this is something that would have been adopted by merchant builders long ago if it was more expedient. I'm not saying its not a good insulation, just that there is resistance to wide spread adoption. We are not trying here to propose the best wall system, but rather the best wall system for widespread adoption. Regarding the placement of the spray foam, I maintain that it constitutes a vapor barrier on the cold side of the wall assembly. This means that you have to study carefully where your dew point will occur. The foam must be thick enough to contain the dew point within the thickness of the foam, otherwise you will promote condensation within your wall cavity. The hazard is that even a well designed wall such as this can experience out of range temperatures which throws the dew point into the batt insulation resulting in condensation. I just think its bad practice. Filling the entire cavity with spray foam eliminates this, but its not inexpensive, and certainly not a candidate for replacing status quo practices. Furthermore, unless combined with a split stud it offers no resistance to thermal bridging of the studs. I really appreciate the feedback and the conversation. But please keep in mind - I am not speculating over this. This configuration has been vetted and value engineered by the Swedish housing industry for over 30 years. This is going to be easier to build, higher performing, and contain the most familiar materials and construction activities than anything else we can propose. thank you to everyone, especially Greg for initiating such a discussion! Fantastic. If you self build this wall we want to see it. Send back photos. A hint for those northerners - Owens Corning Canada powns Owens Corning USA. Standard offerings up north include 5.5" batts for 2x6 walls rated at R24. They also have a 7" batt at R28 that has this walls name written all over it. Time to call your Ownes Corning representitive and tell them its time to show us the Money down here in the US. We want insulation! I'm a builder and I'm interested in this concept, I'd like to hear what this wall system would look like when designed for a "cooling centric climate"? Any thoughts on that? A good question that I've not tackled yet. I have to admit I'm a native "heating centric climate" and I don't have the same intuitive sense of how much insulation is appropriate. But we can speculate. I don't know if cooling loads would ever justify a 2x8 wall, in terms of just attaining high insulation values. Also true cooling climates want to have the vapor barrier, or vapor retarder towards the exterior which in this case is the warm side. So now the placement of foam on the exterior surface is appropriate for the control of condensation in the wall, but not sure if it makes sense for the amount of insulation needed. Furthermore desert climates, which may be primarily dry won't have a critical condensation issue, but will have drastic swings between daytime and nightime temps - they often benefit from high thermal mass walls that absorb heat all day and radiate it at night. So there is no simple generalized approach - walls always need to be tuned for climate. I'm curious how the Passive House Standard, largely conceived in Germany with their climate perhaps most similar to the lower norther east, I'm curious how it is applied in other climates here. 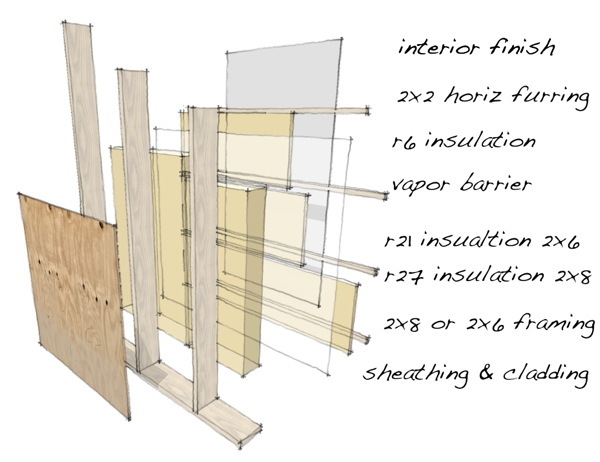 We're in the process of designing and pricing a 2x8 wall for our new house. I didn't realize that others were thinking about this--2x8 was simply my response to a double-stud wall, which seems more complicated and less burly than going double. The local climate (Louisville, KY) will require that the vapor barrier be located on the outside of the wall, I believe. I'm curious on your thoughts about using, say, a 1/2" foam board layer, seams taped, over the plywood sheathing. Specifically, my question is would you hang concrete board siding right onto that without furring strips? So, not a true rain screen wall, I suppose--no air gap or flashing--but a water/vapor-resistant layer with Hardi-panel sandwiched atop as the siding material? This seems much cheaper and simpler than a rain screen, but with most of the benefit. Any insight is appreciated. Hi Keith, If your vapor barrier or retarder is to be on the outside of the wall, then you can probably use the foam to create that barrier, taped as you say. That will also help with the thermal bridging of the studs. Half inch is not that much, but may be fine in your climate - I can't say without research. With the vapor line outside you don't need the interior wire chase space as switches and outlets will not be making holes in your vapor barrier. As far as the siding, it seems to be placed over insulation often, and I would expect most times without a furring space like a rain screen. But I would consult the siding manufacturer to see what they say about how thick the foam can be with the fasteners. As far as having the benefit of the rainscreen, well I don't think it does. That space is helpful in keeping water away from your wall and allowing the siding to dry on the back if water does get through. You also have to remember that the foam makes it harder to properly counter flash your wall because you can't get behind it, only tape to the surface. More conventional building paper and tyvek allow you to lap these layers over the top of flashing helping to move water out of the wall. If the foam replaces these wind barriers you have to make sure your flashing is properly installed. Thanks, Greg. Keep of the good work! I dig your designs and willingness to share thoughtful info. Stephen - very interesting. That Roxul rock wool looks just like the Swedish insulation, and I have to note that they are offering a 5.5" batt for 2x6 walls that is rated R23. Thats should be interesting news for the glass batt makers here in the US. Maybe those Canadian R24 batts may start coming to us now? Been digging into Roxul's product offering now and I'm thrilled to report that Roxul is already offering a 7.25" batt for 2x8 walls, rated at R28. Right now. You can special order it from your Home Depot. How awesome is that? This is clearly the right insulation for this wall, and its very satisfying to see it come full circle back to the type of insulation they are using in Sweden. Have you thought that possibility through? 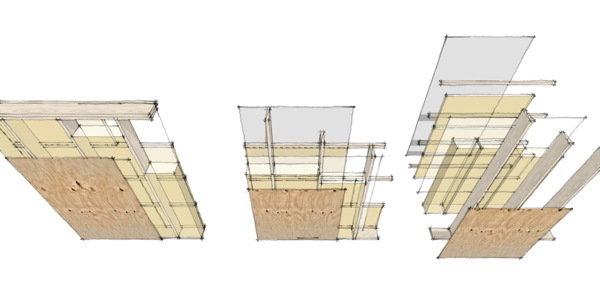 If it were panelized, would you recommend balloon framing for 2 story homes? Think about it, the delivery truck has a crane and places the 17' tall x 8'wide panels on the preset mudsill. A few nails will hold the walls in place until you hang the upper floor joists on the ledger. 1. The 2x8 plate can be cantilevered out to overhang the exterior foundation insulation nicely. 2. You have solved the electrical box problem above, no need for special boxes. 3. Does it have the same number of inspection visits as a standard wall? Kevin - you are right. Clearly this multi layer wall is easier to build in the factory than it is on site. And as we've stated elsewhere, factory fabrication makes more sense as the wall becomes more complex and more value is built into the system. We have thought it through and in fact its been considered first for panelizing, and second for site building. Balloon framing is possible, but it does make panels much harder to handle in the factory. Installing larger panels may require a larger crane on site - perhaps makes sense for a developer that can keep a larger crane in a subdivision for a longer time. But for a one site at a time builder using a crane lift mounted to the delivery truck, they may do better with smaller panels. Another consideration is if you are panelizing the floor as well, it can be easier to place that into the top of a ground floor panel than lower it through a balloon frame. In fact I would not try it - for a two story panel I'd say build the floor level in place. 1. yes, the 2x8 wall is strong enough to overhang slab edge or exterior basement insulation. But I'd rather keep the sill flush and see the siding furred out on a rain-screen, better yet fill that furred cavity with R6 cavity insulation. 2. yes, I think the electrical part of this proposal is sound. 3. this is a good question, and it depends on the local inspections. Some places have separate inspectors for electrical and general construction, others have a single inspector. If you have one inspector he will have to come twice before you close up. If you have separate trade inspectors you have the general look at the framing before you insulate and hang the vapor barrier. Then once the furring and electrical is up the electrical inspector can be called. thanks for all your replays. i actually come from europe, however not from sweden. and i can tell you, conventional structures built here would not pass. i was shocked how poorly the houses are built, and was trying to develop something that would meet at least basic requirements for the buildings in slovakia, where i come from. i am not going to argue with you as the systems are different and i only have experience with the one i mentioned. we havent single complaint so far. also i think this discussion is great for people to start seeing what are the other options to build their homes. I watched you build your house on your blog and believe me when I say I greatly admire not only the building science you applied to your house,but I also love the design. The differences we are having in the discussion is more about anticipating and accommodating the status quo's preferences for how houses are built. There is no easy answer because to make better performance it has to be somewhat different. I am trying to limit the differences to "more work" rather than "different work" or "different materials". That allows the builder to approach this with confidence, knowing what they are building with and where they are getting it from, knowing who they will sub contract the work to, and being able to reliably estimate their time and work profitably. That takes nothing away from your wall which likely performs better. agreed, we had so much trouble finding contractor, most of them backed up after seeing plans. Might you continue this thread, or at least branch out on a natural tangent, with the joint detailing at various intersections: foundation/sill, top plates, wall/panel corners, etc.? It might be educational for all. It is a natural tangent, but I'm not sure if it is something I want to get into on the blog. We are still studying these details and there are more than one way to handle them. An Owens Corning support and service rep recommended 2 layers of R15 (3.5x2=7") for a 2x8 wall R30. He felt the two batts would certainly expand and fill that last 1/4", and if so would probably rate R31-32. This really does not seem like such a bad solution, but it is more work to install than a single batt. In the upside though, you could probably hit R27-28 with two R13 batts of the same size, and this is the most readily available insulation you could ask for. I still really like the mineral wool and I think it has some superior characteristics. But all the same this just points out that you can really build this proposed wall without any special products, and that speaks to its potential to be widely adopted. Greg: how do you deal with services that need to pass through like dryer exhaust pipes or external wiring needs like plugs? There are always going to be some penetrations. Dryer exhaust, or the vent of a high efficiency heater. If a heat recovery system is used - likely if the house is very air tight - then that of course has an air vent that passes through the wall. You have to properly seal the vapor barrier to these penetrations. That is what is supposed to happen in any wall, not just this one. curious, would you propose the particle sheeting in the interior wall in a room like a kitchen/laundry room for the benefit of cabinet installation? Also, do the drywallers tend to use less screws in such a system for attaching the drywall? or are they still trying to get rows every 12/16"? I have not included that in the initial sketch shown above Rob. It just seems too beyond our normal practice here. Not that I don't think its a good idea - its a great idea. And yes, its for the benefit of hanging cabinets and shelves. I think you have a good idea that it might make sense in a limited group of rooms where you are more likely to hang things, like a kitchen or laundry room. I don't know if the Swedes use less screws with this practice. They indicate 13mm drywall which is roughly equal to our 1/2". I suppose since it was fully supported by a particle board sheet you might be able to go down to thinner drywall. I'm not even sure if that would be worth it. Greg, I'm wondering what the effect on wall bracing is by detaching the drywall from the studs. The prescriptive tables in the code for bracing on continuously sheathed structures assume drywall fastened to the stud on the inside. Same comment for the guys doing double 2x4 walls. I guess you could always just double up the amount as you do on interior braced wall panels where you can only cover 1 side. My other dummy question is what happens to the moisture condensing on the vapor barrier? I seem to recall a township in NJ (West Windsor) requiring a poly film vapor barrier back in the 80's until all the drywall turned black and rotted on the outside walls. Then it was back to batts and kraft paper and the assumed bit of leakage around the edges. If you run the wiring in the furring space with the solid foam insulation, how do you fit the insulation around the wiring? Or would you install the solid sheet first and then just rout out the channels where they were needed? Would it make sense to have the framer install the batts and cover them with the poly as he erects the wall? 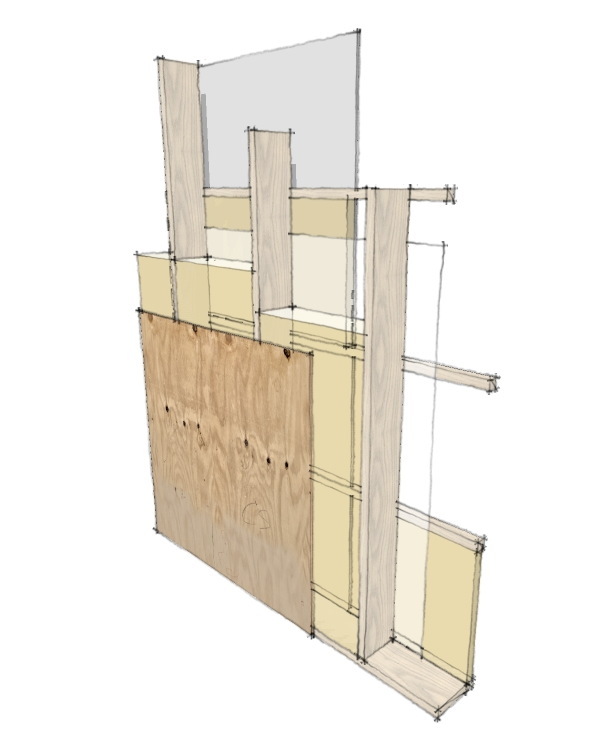 He could then install the furring strips on the back frame stage, With a clear poly, the batts would be visible for the frame inspection, and the insulation inspection could then view the foam panels and sealing details prior to drywall. Tom - I don't think the furring layer will significantly alter the bracing offered by the drywall layer. The studs still can not rack without deforming the drywall. Question 2 - there will be no moisture condensing on the vapor barrier. The vapor barrier in this wall system is within the dew point of the wall. Question 3 - the wiring chase layer is insulated with 1.5" batts, not foam. This layer is approximately R6, and is trimmed around boxes, and passes over wires without any special work. Its not like fitting batts around wires that run in the center of a stud. The wires here can be against the vapor barrier and the 1.5" batt simply laid over them. Question 4 - I like your proposed sequence because its faster, and eliminates double trips to the site. But it will require some cooperation of the inspector. There may be framing he wants to see before the voids are filled with insulation. But a close in inspection could certainly happen before the 1.5" layer of insulation goes in as it is so far beyond what code requires the inspector may not feel they have to see it. Just a quick question guys and I wouldn't be surprised if you laughed at me, but I have been watching all the videos on Youtube on how German companies are building these panelized homes (same as the Swedes) and for the life of me I don't see how they are securing them to the foundation or floor cassettes and to each other, including the corners. The wall panels are finished with stucco on the outside and the walls are painted on the inside and there is no opening for bolts and stuff. The crane just plops them down and brings the next one. The guys don't seem to be doing much of anything and there is no strip of wood running on the floor to secure the panels to... nothing. What gives? I can't speak for the Germans, but the Swedes you are probably just missing what's happening. I've described it before. There is a tongue and groove connection so to speak. There is a sill plate bolted down to the foundation - its offset from the edge. And the bottom plate of the wall has a groove equal in size to the still. The plate is carefully installed, the wall is positioned by the plate so that you don't have to try to be precise while placing it with the crane. After its in place a series of heavy lag screws go in horizontal through the joint. They are later covered by the baseboard. Maybe you missed it. There is often a rubber gasket in the joint. But thats how it goes together. Yeah, I didn't see that in the Swedish video either. There is DEFINITELY nothing visible on the concrete slab in the German videos. It's a clean slab and they just plop it down and go for the next one. But I said that already. And I'm sorry but what about the corners where the two panels meet? At corners they often leave the end of the panel without drywall so that the framing of two panels can be fastened together. I’ve been following these comments, and thought I’d pipe up with a few of my own. First: this is great stuff. There are lots of good questions being asked. Do you have any cost information comparing this wall to a simple 2x6 stud wall filled with, say, 4” of closed-cell foam? That’s about as simple a wall as ever was – nothing finicky or labor-intensive about it – and the aged R-value is about the same as your wall, with significantly less opportunity for infiltration. I understand your reticence regarding SPF, but it’s quickly becoming commonplace in many markets. It seems like you’re including the furring space only to accommodate wiring; is that correct? Do you think there might be an alternative to routing electrical in exterior walls, thereby eliminating the furring space (and associated labor and materials)? What if switches and lighting were located on interior partitions only, for example, with floor-mounted outlets at exterior walls? If you’re trying to find batts in the right thickness for an unconventional assembly, don’t hesitate to use a thicker batt and compress it to fit. It does not reduce the effective R-value of the insulation, contrary to what many say. I’m not a fan of Dimwit’s SPF/batt wall, at least not in heating climates. By the time you spray enough foam to get the dew point out of the batts, you might as well spray a bit more and forego the batts entirely. The R-value would improve considerably with only a marginal cost increase. I don’t think that adding particle board under the gypsum board as a matter of course is responsible. I’ve done it, but even if the material is cheap, the benefit is very small relative to the resources consumed. And finally: I’d like to see more discussion of cellulose insulation – not just here, but generally. Once total resource consumption is considered (during both manufacturing and use) cellulose is more effective insulation than fiberglass, mineral wool, polystyrene or polyurethane. I don't have cost data, but even if it was favorable to spray foam, or cellulose, that is only part of the picture. I don't see spray foam becoming commonplace, nor cellulose. If it does someday, great - then the fight to improve wall systems is won. 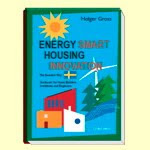 But till then the idea is to propose something that can be easily adopted the vast majority of builders who are not taking any steps towards efficiency. Filling the cavity with spray foam will get a lot of insulation in there, but does little to off-set the thermal bridging of the studs. The insulation type really does not matter that much. Breaking the thermal bridge of the studs is the first challenge. Second challenge is a tight envelope. In the USA New Wall the wiring space does this, as well as enable you to have a vapor barrier without holes. The last challenge is eliminating the bridging of the various horizontal plates in a typical stud wall. This is where alternate framing schemes, double studs, etc come into play. It just so happens that the way the Swedes frame walls because they are constructed in panels limits bridging by the plates. It does not make them go away as it could with a double stud, but its a great improvement over a conventional platform framed wall. But the insulation so long as you have enough of it can be any type. It might as well be something everybody already knows how to work with - batts. And if batts, mineral wool has better qualities than fiberglass. Better r-value, easier to handle and install, fills voids much better. I have to apologize – I somehow missed the fact that the interior furring reduces thermal bridging. I was asleep at the switch: that is a significant benefit over the simpler SPF wall I described. I have to say, though, that in my market at least (upper Midwest) builders would be more likely to use SPF than add furring to all the exterior walls. Local conditions weigh heavily, so if you’re intent on designing an improved wall to be easily adopted by all markets, you may have given yourself an impossible task. Thank you, by the way, for making all this information available. It’s really critical stuff. No C-Dub, not for all markets. The US has too many climates for there to be one wall for all. I've just started with the heating climate. I hope to look at cooling climates later. And this is not a proposal for everybody to build the same wall. If builders in your location are already adopting SPF, great. This wall is for builders who have not been willing to change their practices, or have been unsure about how to improve performance. We are not preaching to the converted here. This is meant to make it easier for those who have not experimented with new configurations. Hi. 2x2 horiz. furring. How they are connected together in corners ? California corners ? Need one stud more? Yes, one vertical furring strip with drywall clips, or two vertical furring strips. One side of the corner will have a stud. The other side you may have a 2x2 nailer to support the end of the furring strips, which is fine - still plenty of insulation left in the 2x6 or 2x8 wall. No need to feel guilty - little change in thermal bridging.